Group 3: 1999 Bunbury Cup (King Brian), 2006 WA Oaks (Moodometer). Listed: 1996 Birthday Stakes (Go The Grey), 1999 Pinjarra Cup (King Brian), 2001 Easter Cup (Special Jester), 2001 Ascot Gold Cup (Special Jester), 2002 Raconteur Stakes (Mapperhollic), 2003 Hannan’s Handicap (Mapperhollic), 2006 Sheila Gwynne Stakes (Moodometer), 2008 Challenge Stakes (Jolanta Star), 2009 Perth Stakes (Wolfe Dreams), 2011 Grandstand Cup (Wolfe Dreams), 2013 Farnley Stakes (Kalahaar), 2014 York Stakes (Mr Utopia). Group 3: 2011 Colonel Reeves (Avante), 2011 WA Oaks (Dreamaway), 2011 Champion Fillies (Dreamaway). Group 1: 2012 Railway Stakes (Mr Moet). 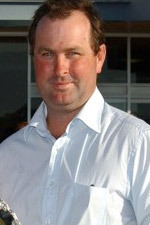 Group 1: 1994 Railway Stakes (Island Morn), 1994 Diabetes 2 Stakes (Island Morn), 2003 Railway Stakes (Hardrada). Group 2: 1993 Champion Fillies (Prime Again), 2001 Karrakatta Plate (Born Priceless), 2002 Winterbottom (Hardrada), 2002 Lee Steere Stakes (Hardrada), 2003 Winterbottom (Hardrada), 2004 Karrakatta Plate (Redwoldt), 2004 Perth Cup (King Canute), 2008 WA Guineas (Moccasin Bend), 2009 Perth Cup (Guyno). Group 3: 1988 Sir Ernest Lee Steere Classic (Wolf Pak), 1989 Quality Stakes (Hard Act), 1989 Strickland Stakes (Timeless Action), 1992 Sires Produce (Rapid Tripper), 1992 Bunbury Cup (Hard Act), 1993 Prince Of Wales Stakes (Daring Hombre), 1994 Strickland Stakes (Prime Again), 1994 Roberts Stakes (Daring Smile), 1995 Roma Cup (Defensive Play), 1995 Sires Produce (Marooned Lady), 1996 Hyperion Stakes (Island Morn), 1996 Scahill Stakes (Island Morn), 1997 Sires Produce (Snooping), 1999 Sir Ernest Lee Steere Classic (Zedamoss), 2001 Champion Fillies (Miss Precisely), 2002 Sires Produce (Hardrada), 2007 WA Derby (Guyno). Group 1: 2012 Winterbottom (Barakey). Group 3: 2013 Sire Ernest Lee Steere Classic (Petrol Power), 2013 Prince Of Wales (Barakey), 2012 Colonel Reeves (Barakey), 2010 Roma Cup (Vain Raider), 2009 Prince Of Wales (Idyllic Prince), 2007 Prince Of Wales Stakes (Idyllic Prince), 2006 Asian Beau Stakes (Idyllic Prince), 2005 Roman Cup (Avenida Madero), 2004 Scahill Stakes (Avenida Madero), 2004 Prince Of Wales Stakes (Golden Delicious), 2001 Hyperion Stakes (Country Blazer). Group 3: 2013 Colonel Reeves (The Rising), 2012 Sires Produce (Luke’s Luck), 2007 Roma Cup (No Questions), 2007 Hyperion Stakes (No Questions), 2005 Sir Ernest Lee Steere Classic (Secret Monarch), 2005 Peters Stakes (Rescuer), 2005 Sires Produce (Denmarket), 2004 Belmont Sprint (Modem), 2004 Roma Cup (Modem), 2003 Peters Stakes (Modem), 1991 Roberts Stakes (Heroicity), 1991 Queens Plate (O’Gay), 1990 Queens Plate (Zip Me Up), 1990 Sir Ernest Lee Steere Classic (Stray Bullet. Group 2: 2011 Karrakatta Plate (Night War). Group 3: 2013 Champion Fillies (Miss Rose De Lago), 2013 Asian Beau Stakes (Platinum Rocker), 2013 Roma Cup (Power Princess), 2012 Sir Ernest Lee Steere Classic (Hard Ball Get), 2012 Scahill Stakes (Power Princess), 2012 Prince Of Wales Stakes (Power Princess), 2011 Sir Ernest Lee Steere Classic (Night War). Listed: 2013 Perth Stakes (Terror Force).